3. DJTMF Biomedical Nanotechnology Institute, University of Miami. Through the use of stem cell-derived cardiac myocytes, tissue-engineered human myocardial constructs are poised for modeling normal and diseased physiology of the heart, as well as discovery of novel drugs and therapeutic targets in a human relevant manner. This review highlights the recent bioengineering efforts to recapitulate microenvironmental cues to further the maturation state of newly differentiated cardiac myocytes. These techniques include long-term culture, co-culture, exposure to mechanical stimuli, 3D culture, cell-matrix interactions, and electrical stimulation. Each of these methods has produced various degrees of maturation; however, a standardized measure for cardiomyocyte maturation is not yet widely accepted by the scientific community. Keywords: Stem cells, Cardiac Myocytes, Differentiation, Maturation, Tissue Engineering. There is a clear need for improved cardiac models for modeling cardiac disease and for use in drug testing platforms . Cardiovascular disease (CVD) is the leading cause of death in the United States, causing ~1 out of every 3 deaths in 2013 . When combined with stroke cases, direct and indirect costs of CVD account for more than any other illness, totaling $300 billion [3, 4]. Further, cardiotoxicity is one of the leading causes of drug failure, accounting for one third of the pharmaceutical drug withdrawals from the market. The development of pluripotent stem cell-derived cardiomyocytes (PSC-CMs) is a significant advancement in achieving viable cells for regenerative therapies and drug discovery. The efficiency, purity, and high-throughput manner of generating PSC-CMs has dramatically increased  from 30%  to 85%  purity since they were first reported in 1998 [8, 9]. This increase in efficiency can be attributed to improved culture techniques and the development of chemically defined media. Although PSC-CMs are routinely obtainable, the morphology [10, 11], calcium handling , electric coupling , contraction stress , and electrophysiology  of newly differentiated cardiac myocytes are immature relative to an adult cardiomyocyte. The morphology of an adult cardiomyocyte is characterized by highly organized sarcomeres, aligned z-bands, increased cell size and cell volume, and binucleation. In addition, a fully mature cardiomyocyte displays proper distribution of junction proteins, cardiac specific markers for contractile proteins and ion channels, increased calcium cycle duration, and increased conduction velocity and action potential duration. This review will focus on various bioengineering methods employed to further the in vitro development and maturation of PSC-CMs. The development of engineered microenvironments, similar to those found in vivo, is the most utilized and effective technique in the maturation of hPSC-CMs (Figure 1). These techniques include long-term culture, co-culture, exposure to mechanical stimuli, 3D culture, cell-matrix interactions, and electrical stimulation. As this review highlights, traditional molecular biology efforts have focused on differentiation of stem cells towards cardiac fate, and a spate of recent bioengineering efforts have focused on furthering the maturation state of newly differentiated cardiac myocytes; however, a quantitative characterization of myocyte maturation as well as commonly accepted metrics for structural and functional phenotyping of stem cell derived cardiac myocytes are critically needed to guide future efforts. The cardiogenesis developmental mechanisms behind cardiomyocyte maturation are outside of the focus of this paper, since they have been exhaustively reviewed elsewhere . Pluripotent stem cells (PSCs) were first differentiated into cardiomyocytes over 30 years ago. Today, PSC-CMs present structural and functional proteins, as well as other cardiac specific markers found in in vivo cardiomyocytes [16-21]. In addition, PSC-CMs display action potentials corresponding to atrial and ventricular cardiomyocytes. Three broad approaches to achieve PSC-CMs have been explored: co-culture-, embryonic body-, and monolayer-based techniques . Visceral endoderm is a key player in the differentiation of cardiomyocytes in vivo during embryogenesis . Identifying the in vivo processes involved in cardiomyocyte differentiation, Mummery et al. developed the systematic co-culture of PSCs and mouse visceral endoderm-like (END-2) cells. Both induced-PSCs (iPSCs) and human embryonic stem cells (hESCs) were induced to differentiate with ~35% success rate. It is important to note, in each culture with beating areas, cardiomyocyte markers were present in merely 2% to 3% of the cells. Only when the medium used was serum and insulin free, or p38 MAPK inhibitor was added to it, did the number increase to 20% or higher [5, 23]. While the differentiation mechanism induced by END-2 is yet to be fully characterized, the method presents several advantages including its simplicity, a quick and inexpensive protocol compared to the embryoid body (EB)-based methods , the ability to perform this technique with fewer cells, high efficacy in producing enough cardiomyocytes of adequate quality , and the capacity for application to numerous types of hESCs and iPSCs . Other approaches resulting in cardiomyocytes include PSCs co-cultured with OP9 stromal cells, as well as with neonatal rat cardiomyocytes [25, 26]. Schematic of engineered microenvironments used to mature human pluripotent stem cell-derived cardiomyocytes. Doetschman et al. engineered myocardium in an embryoid body (EB) developed from mouse embryonic stem cells (mESCs) . ESCs were cultured in suspension and subjected to the presence of differentiation signals, such as transforming growth factor beta (TGF-β) and Wnts. ESCs developed into spherical aggregates, termed embryoid bodies, resembling an early embryo [28, 29]. While EBs are extremely heterogeneous in structure and composition, 5%-70% of EBs display spontaneously contracting cardiomyocytes [5, 30]. The density and timing of PSC seeding, the specific cell line, and the medium used for culture are important considerations during the development of an EB [5, 31]. An important advantage of using EBs for generation of cardiomyocytes is the ability to grow in 96- or 384-well plates allowing for higher throughput . Nevertheless, inconsistent results, low yield and the persistence of an immature phenotype remain drawbacks [30, 32]. For these reasons, the development of spun, microwell and micropatterned EBs were investigated to achieve increased reliability, reproducibility and robust differentiation techniques as they allow for precise control of EB sizes [6, 33-39]. Monolayer PSC-CMs were first reported in 1999 when mouse bone marrow stromal cells were cultured with 5-azacytidine. However, this technique had a low efficiency (30%) after 2 weeks of treatment . Subsequent monolayer differentiation methods seek to simulate the chronological stages of in vivo cardiogenesis, utilizing growth factors and small molecules to drive the PSCs through mesoderm, cardiac progenitor, and functional cardiomyocyte phenotypes [5, 8, 29]. Initial protocols employed RPMI-B27 medium supplemented with human recombinant Activin-A on the first day, followed by human recombinant BMP4 during the next four days, after which they were cultured in pure RPMI-B27 for up to three weeks. This protocol yielded beating cells on day 12 and the final colonies were comprised of ~30% cardiomyocytes . Unfortunately, this protocol produced high variability across and within cell lines. Recently, the Wnt/β-catenin signaling pathway was elucidated as evidence indicated the pathway is upregulated in the early phases of differentiation but downregulated once the mesoderm is formed . Based on these findings, Lian et al. differentiated cardiomyocytes from several iPSC and hESC lines more efficiently. The stem cells were exposed to CHIR99021 during the first day of differentiation to inhibit GSK3, which in turn stimulated the Wnt/β-catenin signaling pathway, followed by the addition of Wnt inhibitors during the following 4 days [41, 42]. Furthermore, removal of insulin from the RPMI-B27 medium during the initial 6 days increased the yield to 82%-95% efficiency. A similar, more laborious approach involved the development of cardiovascular progenitor cells, which were expanded and later differentiated into cardiomyocytes . In 2014, Burridge et al. built on the protocol developed by Lian et al., with slight modifications to the timing and composition of the media. The innovation of this approach lies in the basal media utilized, which contained only three highly defined components as opposed to poorly defined RPMI 1640 + B27 media. As a result, they obtained a highly robust and efficient method yielding over 85% purity . Most recently, it was determined that RPMI medium without B27 supplementation is sufficient for differentiation, ridding the protocol of albumin and creating the first completely chemically defined approach to differentiation with 88%-98% efficiency across several hESC and iPSC lines . Independent of media composition, monolayer cultures produce cardiomyocytes efficiently with presentation of more mature phenotypes, including ventricular, atrial and nodal [5, 7]. Before evaluating the state of maturation for human pluripotent stem cell derived cardiomyocytes (hPSC-CM), it is important to understand the characteristics used to quantify maturation in adult human cardiomyocytes. The most widely studied and utilized measurement of maturation is cell morphology. Human adult cardiomyocytes have a distinct anisotropic rod shape characterized by a length to width ratio of 7:1 [11, 45-47]. As the cardiomyocyte matures it elongates, increasing its cell area and volume, leading to an increased membrane capacitance of ~150 pF in humans (Figure 2) [11, 13, 46, 48-50]. Early cardiac cells are highly proliferative; however, as they mature the cells become hypertrophic and ~25% of human cardiomyocytes exhibit binucleation [12, 48, 51-54]. Another thoroughly studied parameter of maturation is gap junction morphology, measured by the expression and distribution of connexin 43 (Cx43) and N-Cadherin. During development, both Cx43 and N-Cadherin become concentrated toward the cell-cell junction; this contributes to a final conduction velocity of 0.3 to 1 m/s in the human adult left ventricle myocardium (Figure 3a) [11, 13, 49, 55]. Cardiomyocytes contain structured myofibrils, which contain highly organized sarcomeres whose length reaches ~2.2 µm (Figure 2c) [54, 56, 57]. The length of the sarcomere is measured from z line to z line, which can be detected through the expression of α-actinin . The sarcomere is part of the contractile apparatus of the cell and is identified by the presence of α-actinin, cardiac troponin T, cardiac troponin I, and ß-myosin heavy chain (ß-MHC) [46, 56]. The troponin I present in the cardiomyocyte switches from slow skeletal troponin I in fetal cells to cardiac troponin I in adult cells [58-64]. Titin, a key protein in the maintenance of sarcomere integrity and elasticity, switches from the N2BA isoform to the N2B isoform [11, 65-67]. Furthermore, there is significantly more ß-MHC than α-MHC in the human adult cardiomyocyte, which contributes to the postnatal heart rate decrease [68, 69]. Fluorescence image of (A) early stage PSC-CM (day ~30) and (B) late stage PSC-CM (day ~100). Stained for α-actinin and phalloidin, indicating an increase in sarcomeric organization and myofibril density with increased time in culture. Scale bar 25 μm . Reproduced with permission from John Wiley and Sons. (C) Median, maximum, and minimum sarcomere distance of human fetal cardiomyocytes (hFetal-CM), and hiPSC-CM and hESC-CM in standard BPEL media, cardiomyocyte media (CA), and maturation media (MM). ns = non-significant; *P < 0.05; **P < 0.01; ***P < 0.001 . Reproduced with permission from Elsevier. (D) Late stage PSC-CM (day ~100) were fixed, stained, and imaged using fluorescence microscopy then compared to early stage PSC-CM (day ~30) for (E) %multinucleation, (F) sarcomere length, (G) cell perimeter, (H) cell area, and (I) circularity . Reproduced with permission from John Wiley and Sons. (A) Fluorescence image of neonatal rat cardiomyocytes in static conditions and after 24 h of cyclic stretch (1 Hz). Stained for Cx43 (green) and N-Cadherin (red) and counterstained with DAPI (blue). Junction proteins display an unorganized distribution in static conditions compared to localized distribution after cyclic stretch . (B) Average contraction stress in mN/mm2 of hESC-CM, hiPSC-CM, and human fetal cardiomyocytes at 14 weeks, 17 weeks, and 19 weeks. ns = non-significant; *P < 0.05; **P < 0.01; ***P < 0.001 . Reproduced with permission from Elsevier. (C) Contraction stress map for a contracting day 30 hPSC-CM showing the range and localizations of contraction stresses . This is an open access article distributed under the Creative Commons Attribution License. (D) Volume percentages occupied by the nucleus, sarcomere, and mitochondria in non-stimulated and stimulated neonatal rat ventricles, and native heart. (E) Frequency of intercalated discs (IC) and gap junctions in non-stimulated and stimulated neonatal rat ventricles and native heart. * denotes statistically significant differences between the groups (P <0.05; Tukey's post hoc test with one-way ANOVA) . Copyright 2004 National Academy of Sciences. (A) Electrically induced Ca2+ of fetal left ventricular cardiomyocytes (FLV-CMs), H1-CMs, and HES2-CMs. Tracings of basal Ca2+ and Ca2+ transients. Bar graphs of (B) basal Ca2+, (C) amplitude, (D) maximum upstroke velocity, and (E) maximum decay velocity of Ca2+ transients. *P < 0.05 versus FLV-CM . Reproduced with permission from John Wiley and Sons. (F) AP of PSC-CM in standard BPEL media, cardiomyocyte media (CA), and maturation media (MM) . Reproduced with permission from Elsevier. Calcium handling is an important consideration when determining the maturity of a cardiomyocyte. The formation of transverse tubules, which run along the z-line regions of the cell, allows the cardiomyocyte to develop synchronous triggering of sarcoplasmic reticulum (SR) calcium release, in addition to rapid electric excitation (Figure 4a-e) [11, 12, 70]. A human adult cardiomyocyte contains internal calcium stores in the SR and exhibits [Ca]2+i transients [12, 69]. To identify the presence of a SR, the regulatory proteins calsequestrin and phospholambam are commonly included for analysis [12, 71]. In addition, electrophysiology and proper ion channel function are fundamental measurements to determine maturation. In a mature cardiomyocyte, transient outward current density (Ito) increases and Ikr, Iks, and Ik1 should all be present [49, 71-74]. 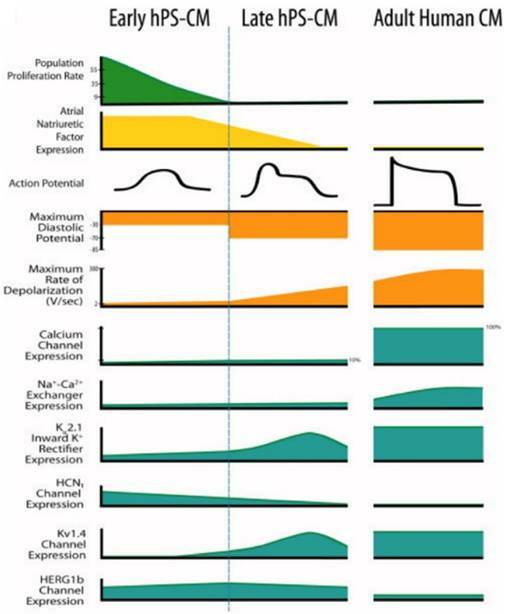 Sodium channel Nav1.5 and L-type calcium channels should increase as the cell matures, leading to faster upstroke velocities and a shorter plateau phase [49, 50]. Immature cardiomyocytes have a higher resting membrane potential (RMP) of about -60 mV compared to the -90 mV RMP displayed by mature cells [12, 71]. The action potential duration at 50% repolarization and 90% repolarization, as well as the conduction velocity are increased in a mature cardiomyocyte [12, 50, 71]. Mitochondrial activity is significantly different when comparing an early cardiomyocyte to a mature cardiomyocyte. In the early developmental stages of the cell, mitochondria are distributed throughout the cytoplasm in a rectangular network, occupy a small volume, have low oxidative capacity, and use glycolysis as the main source of energy [12, 51]. As the cardiomyocyte matures, it becomes regularly distributed in a crystal-like lattice pattern with lamellar cristae, occupies 20-40% of the cell volume, maintains increased oxidative capacity, and uses fatty acid ß-oxidation as its main energy source (Figure 3d) [12, 51, 75]. Contraction stress, another important measurement in determining maturity of a cardiomyocyte, is one of the most difficult parameters to obtain due to the absence of a standardized assay (Figure 3b). The nonexistence of a commercially available assay has prompted researchers to develop unique techniques [47, 76-79]. Furthermore, contraction stress can be measured on the cellular, tissue, or whole organ level, leading to increased variation in reporting. To date, a peak isometric twitch tension of 44.0 ± 11.7 mN/mm2 (note: 1 mN/mm2 = 1 kPa) for human myocardium has been reported . Finally, gene expression should be quantified and reviewed to assess the maturity of cardiomyocytes. In the adult myocardium, there is an increase in genes encoding for sarcomeric proteins (ACTN2, MYBPC3, MYH6, MYH7, TNNI3), calcium handling genes (SERCA2, RYR2, CACNA1C), and sodium and potassium ion channels (SCN5A, KCNH2, KCND3, KCNJ12, KCNQ1), with a decrease in HCN4 (Figure 5a-g) . No singular measurement can be used to determine maturation and an assessment of the functional parameters discussed here should be considered. 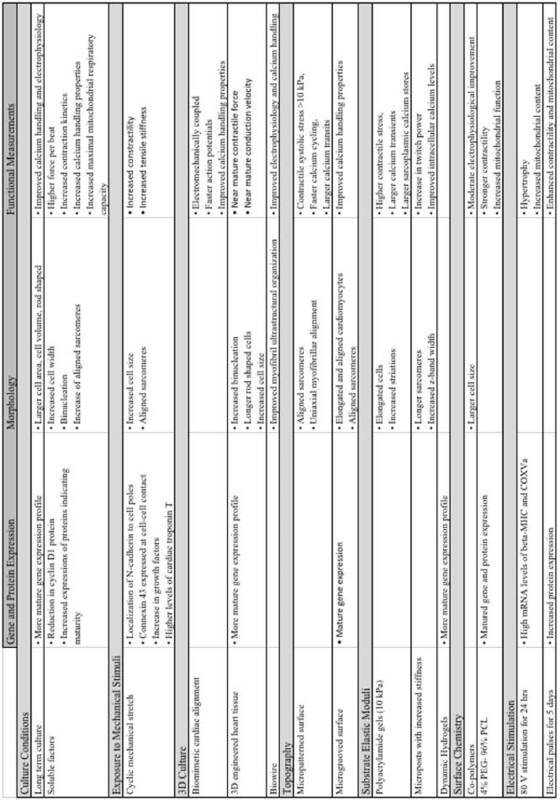 For a summary of the major advancements in the maturation of cardiomyocytes refer to Table 1. Cardiac myofibrils are densely packed and contain highly ordered sarcomere structures that self-assemble during embryonic and post-natal development. While these processes are not well-understood, an intuitive method to replicate mature myofibrillogenesis in engineered cardiac cells and tissues is prolongation of in vitro culture. Lundy et al. cultured hPSC-CM in vitro for up to 120 days . The study compared prolonged culture (80-120 days) to standard culture (20-40 days) and found that the cells cultured for an extended time exhibited improved calcium handling and matured both morphologically (Figure 2a-b) and electrophysiologically. The addition of relevant soluble factors to an in vitro system may promote cardiomyocyte maturation. Different media have been explored for this purpose, including both commercially available and custom-made cardiomyocyte media. An important hormone involved in the differentiation and maturation of cardiomyocytes is Tri-iodo-L-thyronine (T3) [82-85]. The effects of T3 were observed on both sheep fetal cardiomyocytes and human iPSCs (hiPSC-CM). Cardiomyocytes exposed to T3 hormone displayed increased cell width and binucleation, a reduction in proliferation and cyclin D1 protein, and an increase in p21 protein and expression of phosphor-mTOR, ANP and SERCA2a, all important indicators of increased maturation . 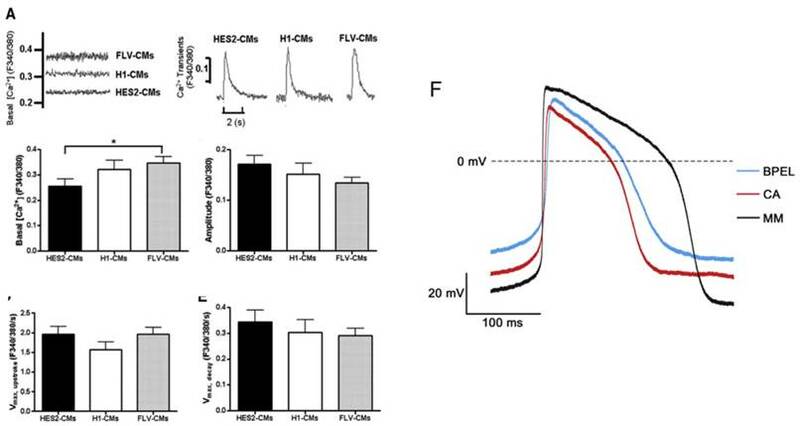 hiPSC-CM exposed to T3 hormone generated a higher force per beat, exhibited increased contraction kinetics and calcium release and reuptake, and an increase in maximal mitochondrial respiratory capacity . Commercially available cardiomyocyte media and maturation media, available from Pluriomics BV, were used to culture second trimester human cardiomyocytes, hiPSC-CM, and human embryonic stem cell-derived cardiomyocytes (hESC-CM) . The contraction stress (Figure 3b), electrophysiology (Figure 4g), cell class frequency, sarcomere length (Figure 2c), and gene expression profile were compared to cardiomyocytes cultured in standard BSA polyvinylalcohol essential lipids medium (BPEL). Human PSC-CM cultured in maturation media showed increased contraction stress (140-170% increase), longer and more organized sarcomere structure, and higher expression of contractile genes. In addition, the action potentials of human PSC-CM cultured in maturation media resembled those of adult left ventricular cardiomyocytes, with increased upstroke velocity, action potential amplitude, action potential duration at 50% and 90% repolarization, and a decreased resting membrane potential. (A) Genetic profile of early stage (~30 days) hESC-CM and hiPSC-CM, late stage (~100 days) hESC-CM and hiPSC-CM, and the adult human heart. Late stage cardiomyocytes show upregulation of MYH7 (β-myosin heavy chain), MYH6 (α-myosin heavy chain), GJA1 (connexin-43), HCN4 (hyperpolarization-activated K+ channel), and SERCA (sarcoendoplasmic reticulum ATPase). *P < 0.05 versus corresponding early-stage PSC-CMs. ∔P <0.05 versus adult human heart . Reproduced with permission from John Wiley and Sons. (B-G) Engineered human tissue (EHT) developed from neonatal rat cardiomyocytes compared to fetal, neonatal, and adult cardiomyocytes. Expression of (B) α-cardiac actin, (C) α-skeletal actin, (D) α-sarcomeric protein, (E) α-myosin heavy chain (MHC), (F) β-MHC, (G) α-/β-MHC. Note in the murine system α-MHC is predominantly present in the adult heart while β-MHC has a greater presence in the fetal heart. In the human system both α-MHC and β-MHC have increased expression in the adult heart. *P < 0.05 versus EHT day 0 (B, C, F, and G) and EHT day 3 (D) or between indicated columns (C, E, and G); ANOVA followed by Bonferroni multiple comparison test . Reproduced with permission from Wolters Kluwer Health, Inc.
Summary of major advancements in the maturation of cardiomyocytes. Intercellular interaction is an important consideration when designing a culture environment for cells. One research group explored effects of non-cardiomyocytes in embryoid bodies on cardiomyocyte maturation. The study specifically evaluated electrophysiological readouts, and concluded that non-cardiomyocyte cells are essential in the early development and maturation of hESC-CMs . One group combined both mechanical stimuli and co-culture with endothelial and stromal cells, which increased the level of proliferation of cardiomyocytes and aided in the development of vasculature structures . Recently, a 3D environment was used to culture hESC-CMs with cardiac niche cells, which included either human mesenchymal cells or human neonatal dermal fibroblasts. The addition of niche cells led to higher passive and active twitch force, aligned sarcomeres, regularly dispersed Cx43 and N-Cadherin, and upregulation of genes indicating maturation . Culture conditions have been shown to play a pivotal role in the regulation and maturation of cardiomyocytes. Long term culture produced increased maturation in multiple functional measurements; however, this method is limited due to prolonged experimental times. The addition of T3 and non-cardiomyocytes into culture systems led to improved maturation, but both methods failed to produce fully mature morphology and functional readouts. Exposure to mechanical stimuli is an important physical cue, which affects the differentiation and development of many cell types. Generation of mature myofibrils in cardiac tissues is dependent on the forces generated by tissues themselves [90-92]. Much of the understanding behind force dependent cytoskeletal maturation of cardiac tissue is borne out of in silico models. Myofibril maturation and concomitant increase in contractility is templated around the organization of the extra cellular matrix, stabilization of the contractile structure due to increase in myofibril length, and lateral coupling of multiple myofibrils into parallel bundles of fibers . Extensive studies have been performed to leverage the positive feedback between sarcomere maturation and contractility by applying cyclic mechanical load on cardiomyocytes, adult stem cells, and human pluripotent cells. Many investigators used a standard protocol, which exposed cells to cyclic stretch over a period of 24-72 h at 10-20% elongation and 1 Hz. A significant amount of work has contributed to discovering the signaling pathways involved in the cellular response of cardiomyocytes to cyclic mechanical stretch. A majority of studies on murine cardiomyocytes have focused on the expression of cell junction proteins such as Cx43 and N-Cadherin [94-96]. If cardiomyocytes were exposed to uniaxial cyclic stretch 3 h after seeding, the N-Cadherin localized at the cell poles compared to unstretched cells, which maintain an even dispersion throughout the cell . Similarly, Cx43 was predominately expressed at the cell-cell contact after exposure to 10% cyclic stretch for 24 h (Figure 3a) . This regimen of stretch also resulted in upregulation of Cx43-mRNA, phosphorylated forms of ERK1/2, glycogen synthesis kinase 3β, and AKT. Stretch contributes to an increase in growth factors such as myostatin, atrial natriuretic peptide (ANP), and transforming growth factor-beta1 (TGF-β1), which all contribute to the growth response of the cell [97-99]. In contrast, a more recent study found a decrease in TGF-β1 after exposing embryonic mouse cardiomyocytes to cyclic stretch . The cardiomyocytes in this study displayed further maturation as indicated by increased proliferation, size, cardiac gene expression, and myofibril protein levels. Unsurprisingly, upon exposure to uniaxial stretch, cardiomyocytes aligned parallel to the direction of the force. One study used mESCs to determine the effects of stretch frequency on cells . Cardiomyocytes exposed to 10% stretch at 1 Hz had lower gene expression, while cells exposed to 10% stretch at 3 Hz had significantly greater gene expression and cardiac-specific cell structures. Investigators recently developed a bioreactor that exposes neonatal rat cardiomyocytes to cyclic mechanical stretch . The cardiomyocytes responded to the mechanical load with increased hypertrophy, a switch from α-MHC to β-MHC, and higher systolic force. Additionally, the effects of stretch on hPSCs were investigated. The study found that after exposure to cyclic mechanical stretch, hESC-CM expressed higher levels of cardiac troponin-T, increased gap junction proteins, displayed cell elongation, and superior cytoskeletal and contractile elements . Furthermore, the proportion of cardiomyocytes in the overall cell population was higher and developed shorter calcium duration, indicating functional maturation. Cyclic stretch conditioning on hESC-CMs and hiPSC-CMs led to cardiomyocyte and matrix fiber alignment, increased cardiomyocyte hypertrophy, proliferation rates, myofibrillogenesis, and sarcomere banding . A recent study reported the combination of exposure to cyclic mechanical stretch and electrical stimulation on hiPSC-CMs. Mechanical stimuli alone produced increased contractility, tensile stiffness, sarcomere alignment, and cardiomyocyte size. After the addition of electrical stimulation, the contractility further increased as well as the expression of RYR2 and SERCA2 . Further investigation is needed to fully characterize the effect of cyclic stretch on cardiomyocyte maturation. The effects of shear stress on stem cells were investigated by Huang et al. . The study used rat bone marrow mesenchymal stem cells and exposed the cells to laminar flow, generating shear stress within the system. Rat bone marrow mesenchymal stem cells exposed to shear stress differentiated into a cardiomyogenic lineage, indicated by the presence of mRNA and protein cardiomyocyte markers. Exposing rat neonatal ventricular myocytes and hPSCs to external mechanical stimuli led to improved distribution of cell junction proteins and matured morphology. Functional measurements, such as electrophysiology, contraction stress and calcium handling properties after exposure to shear stress need to be further studied. 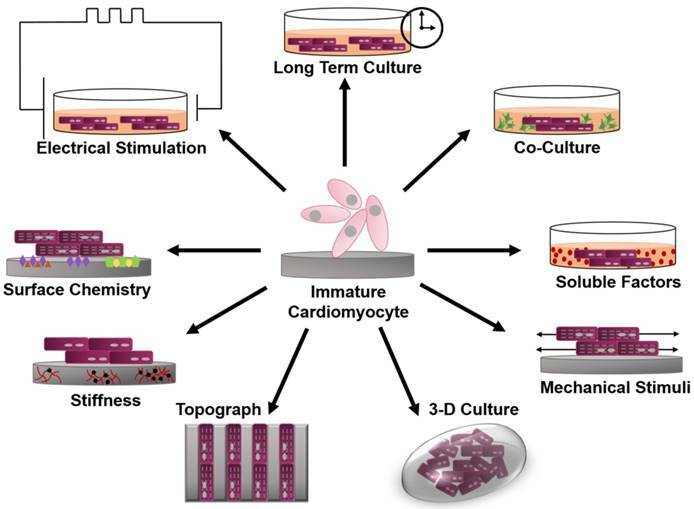 Three-dimensional culture conditions have been explored for the purpose of cardiomyocyte maturation. Bian et al. cultured neonatal rat cardiomyocytes in a 3D environment with biomimetic cardiac alignment similar to the epicardial fiber orientation found in the adult heart . After 3 weeks of culture the 3D cardiac structures contained aligned electromechanically coupled cardiomyocytes with capillary-like structures. Of greater significance, the action potentials of the cells showed enhanced conduction velocities and directional dependence on local cardiomyocyte orientation. The calcium handling properties were improved with results depicting accelerated Ca2+ transient kinetics with both L-type Ca2+ channels and ryanodine receptors present. Another group developed 3D-engineered heart tissue from neonatal rat cardiomyocytes to observe the effects on terminal differentiation, organotypic maturation, and hypertrophic growth . 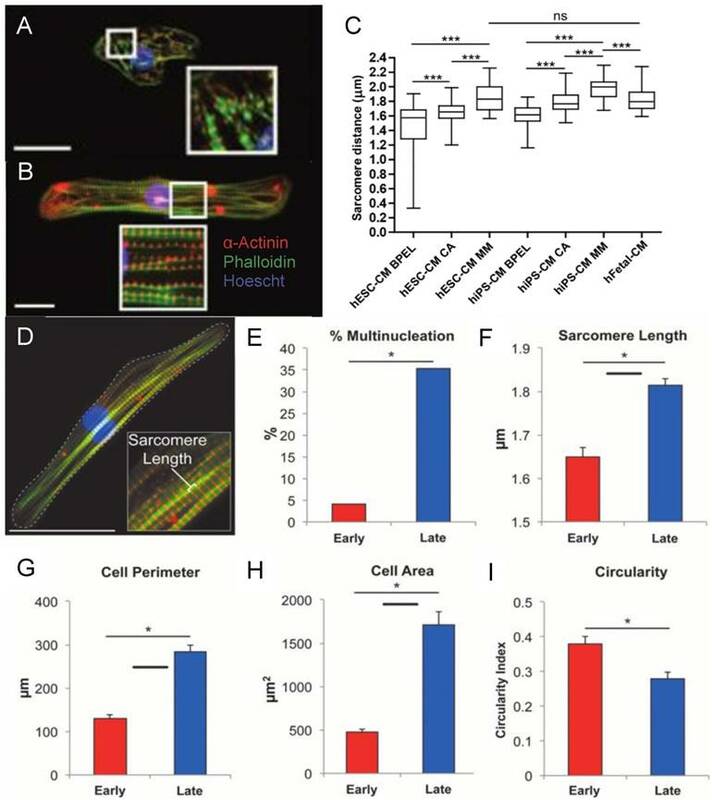 The study concluded that engineered heart tissues promote a high level of binucleation, maturation of the gene expression profile (Figure 5b-g), and development of a rod-shaped and anisotropic sarcomere organization. Several other studies have explored 3D culture techniques using hESC-CM as a cell source. A biowire, defined as a 3D aligned cardiac tissue with frequent striations, composed of hESC-CMs, was combined with electrical stimulation to explore the effects on cardiomyocyte maturation . The biowires showed improvement in both electrophysiological and Ca2+ handling properties including higher conduction velocities with tissues displaying improved myofibril ultrastructural organization. One group reported the use of a tissue patch similar to the structure developed by Bian et al. ; however, hESC-CMs were seeded onto the fibrin-based cardiac patch. Each patch had a cardiomyocyte purity ranging from 48-65%. The 3D architecture of the patch combined with a high cardiomyocyte purity induced longer sarcomeres, higher conduction velocies, and enhanced expression of contractile genes . Dynamic culture of 3D engineered “cardiobundles,” composed of either neonatal rat ventricular myocytes or human PSC-CMs was recently reported. This 3D system was exposed to a dynamic culture condition for 2 weeks, resulting in near-mature contractile force and conduction velocity, as well as increased expression of sarcomeric proteins and greater cell size . Another study used native cardiac ECM to create a 3D scaffold for the in vitro culture of hiPSC-CMs. This novel 3D structure produced cardiomyocytes with improved expression of calcium handling genes and calcium handling properties . Three-dimensional culture conditions have increased multiple morphological and functional properties of immature cardiomyocytes including increased binucleation, rod-like cell shape, increased sarcomere alignment, electrophysiology, and calcium handling properties. While some functional measurements were recorded, the nature of a 3D system hinders the ability to easily obtain measurements, such as contractile stress, which allow researchers to develop a complete profile of cell maturity. The native human myocardium is composed of striated tissue containing myofibrils, Z bands, and sarcomeres. Muscular thin films (MTFs) are an innovative technology allowing cardiomyocytes to be cultured on a 2D PDMS layer, which is then cut and contracts freely [111-113]. Different topographical designs have been investigated on the surface of the MTFs using microcontact printing of fibronectin. The difference between isotropic (ISO), anisotropic (ANISO), and arrays of discrete muscle fibers (LINES) have been investigated thoroughly [111, 112]. ISO patterning leads to unaligned sarcomeres, lower peak sarcomere generated stress (~1 kPa), shorter conduction velocities and slow Ca2+ cycling. In comparison both ANISO and LINES have aligned sarcomeres, uniaxial myofibrillar alignment, develop contractile systolic stress >10 kPa, and faster Ca2+ cycling with larger transients. These results indicate a more mature phenotype for the biomimetic ANISO and LINES topography. Another study investigated different shapes microprinted onto MTFs including circular, square, and rectangular shapes with increasing aspect ratios . Cardiomyocytes cultured on the circular pattern developed myofibril filaments, Z bands, and sarcomeres, which were in disarray with no uniform length or orientation. The rectangular configuration with an aspect ratio of 7:1 resulted in myofibril filaments aligned parallel to the longitudinal axis with higher density toward the edges of the construct and Z lines perpendicular to the longitudinal axis. Kuo et al. investigated the link between cardiomyocyte shape and its effect on contractile strength and sarcomere alignment . Myocyte shape alters the myofibrillar structure and the calcium handling ability of the cell, which, in turn, affects the development of contractile forces. These findings link the importance of topography for the culturing and maturation of cardiomyocytes. Another approach used a microelectrode array coated with fibronectin and gelatin where the surfaces were microabraded either parallel or perpendicular to the channel . The highest conduction velocity was present in the neonatal rat cardiomyocytes and neonatal rat mesenchymal stem cells in the perpendicular configuration. Interestingly, the highest intensity of Cx43 was found in the parallel system. One method for cell alignment is to culture cells on microgrooves or microridges. After 7 days in culture, neonatal rat cardiac myocytes on a microgrooved polystyrene surface displayed elongation and aligned along the microgrooves. Furthermore, the cardiomyocytes showed aligned sarcomeres, a phenotypic sign of maturation . Another study created a gradient of microgrooves, ranging from 8-100 µm in width and 5-1000 nm in depth, onto a polymer substrate. The hiPSC-CMs expressed the greatest maturity on the “ND region” (8-30 µm wide and 850-1000 nm deep). The ND region contained hiPSC-CMs with high alignment, increased elongation and larger eccentricity, with an average sarcomere length of 1.8 µm indicating maturation . The microgroove approach was recently sized down to a nanoscale level to determine the effect of nanotopography on hiPSC-CMs. The study concluded that grooves with a width of 600-900 nm produced the greatest maturation of hiPSC-CMs, as shown by increased cell area, cell perimeters, elongation, and anisotropic structure . Combined physiomimetic cues have been explored, including the creation of a 3D polycaprolactone fibrous scaffold with anisotropic patterning. Similar to previous reports, cardiomyocytes in the 3D aligned microenvironment displayed matured gene expression and improved calcium handling properties . The addition of topographical cues in the culture microenvironment provides important signals to the cells, influencing alignment and morphology. A central consideration while recreating a cell niche is the extracellular matrix (ECM). In the cardiac system, myocardial ECM stiffness increases during cardiac development with a final elastic modulus of 10-20 kPa. Researchers have worked to further cardiomyocyte maturation by culturing these cells on substrates of relevant stiffness. When neonatal rat cardiac myocytes were cultured on polyacrylamide gels of different elastic moduli, optimal maturation was achieved on substrates with stiffness similar to in vivo values, falling between 22-50 kPa . Cells cultured in this range maintained increased elongation and striations, higher contractile strength, and adequate excitation threshold. Many of the studies that cultured cardiomyocytes on substrates of varying elastic moduli found that 10 kPa produced the most promising results independent of cell source. In 2008, Jacot et al. cultured neonatal rat ventricular myocytes on collagen coated polyacrylamide gels of varying stiffness . This study found that cardiomyocytes cultured on substrates with an elastic modulus of 10 kPa produced the greatest contractile stress, which can be attributed to the RhoA/RhoA-kinase (ROCK) pathway being activated. Cells on this stiffness produced the largest calcium transients, sarcoplasmic calcium stores, and sarcoplasmic/endoplasmic reticular calcium ATPase2a (SERCA2a) expression. Similar to the Jacot study, another research group investigated the effects of substrate stiffness on both hPSCs and neonatal rat cardiomyocytes . Two-dimensional polyacrylamide gels with elastic moduli ranging from 4.4-99.7 kPa were used to culture both cell types. The results revealed a positive correlation between substrate stiffness and contraction stress (Figure 3c) of the cardiomyocytes, with the maximum contraction stress on the 99.7 kPa stiffness. These results contradict previous reports indicating an optimal stiffness of 10 kPa for maximum average contractile stress with lower contraction stress on softer and stiffer substrates. While many of the current studies use traction force microscopy to measure contraction stress, a new method was reported that utilizes both optical line scanning and subcellular force to measure twitch power on neonatal rat cardiomyocytes on microposts with increasing stiffness . The authors concluded twitch power is greater for cells on stiffer posts, however, the twitch velocity is slower. Cardiomyocytes on the stiffer microposts had longer sarcomeres, increased Z-band width, and improved intracellular calcium levels indicating a more mature phenotype. Similarly, a platform was developed which cultured cardiac microtissues on microcantilevers of varying stiffness . There was a positive correlation with the rigidity of the posts and the strength of contraction. However, there was a negative correlation between degree of alignment and micropost stiffness. A recent study investigated the response of fetal chicken heart cells to a time-dependent thiolated-hyaluronic acid (HA) hydrogel . The substrate was crosslinked with poly (ethylene glycol) diacrylate, which induced stiffening from 1.9 kPa to 8.2 kPa. The study used early and late cardiac genetic markers to determine maturation stage. The fetal chicken heart cells showed downregulation of NKX2.5, an early cardiac marker, on the HA hydrogels compared to control static polyacrylamide gels. 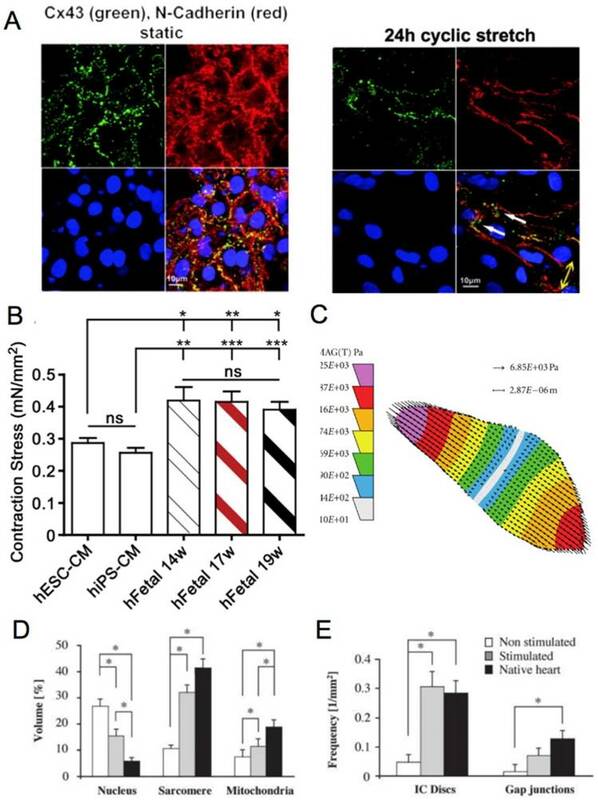 Additionally, cardiomyocytes cultured on HA had a ~3-fold increase in the late cardiac marker troponin T. Although multiple studies using neonatal rat ventricular myocytes on substrates of varying stiffness have been performed, the effect of stiffness on hPSC-CMs is lacking. Stiffness is an important factor influencing the morphological and functional outcomes of cardiomyocytes; therefore, further studies including hPSC-CMs and temporally stiffening microenvironments are of interest. The extracellular matrix network of cardiac myocytes remodels its composition during development . While fibronectin dominates during development as well as during pathological remodeling [124-126], collagen becomes the primary ECM component by adulthood [110, 127]. In vitro experiments with isolated cardiac myocytes have revealed dependence of cellular proliferation , survival , signaling , and cytoskeletal remodeling  on culture substrate coatings. ECM composition that mimics the native heart has been used to direct the differentiation of embryonic  and bone marrow  derived stem cells towards cardiac lineage. A new approach involves the development of tailored synthetic biomaterials to mature stem cell derived cardiomyocytes. For example, one study investigated 96 (meth)acrylate and 20 (meth)acrylamide monomers to produce a serum free array of 576 co-polymers . This platform was scaled down to the 3 most promising co-polymers, which showed improved cell adhesion, higher cardiomyocyte densities, and larger cell size. Cardiomyocytes cultured on the 3 sets of co-polymers showed moderate electrophysiological improvement when compared to human fetal cardiomyocytes, yet were significantly less mature than human adult cardiomyocytes. Another group developed a synthetic polymer composed of 4% polyethylene glycol (PEG) and 96% poly-ε-caprolacton (PCL) to culture hiPSC-CMs . After 15 days in culture, the cardiomyocytes on 4%PEG / 96%PCL exhibited stronger contractility than both glass and 100% PCL controls. Furthermore, this combination produced increased mitochondrial function, gene and protein expression. A recent study utilized a “Matrigel Mattress,” consisting of undiluted matrigel, to culture single hiPSC-CMs. Cardiomyocytes cultured on the Matrigel Mattress displayed a matured phenotype, which included rod-shaped morphology, cell elongation, longer sarcomeres, higher expression of cardiac troponin I, and increased upstroke velocity. Arguably, the most significant result was the ability to produce single-cell contracting hiPSC-CMs in a rapid manner . Similarly, matrigel coated polydimethylsiloxane (PDMS) was compared to fibronectin coated PDMS, matrigel coated glass, and fibronectin glass. iCell cardiomyocytes, a commercially available cell source (Cellular Dynamics International, Inc), cultured on matrigel coated PDMS developed functional electrophysiological maturation, increased conduction velocity, and exhibited the presence of cardiac troponin I . Together these findings indicate that surface chemistry strongly influences cardiomyocyte contractility, electrophysiology, gene expression, and cell morphology. Cardiomyocytes have internal electrical signaling networks that activate myocytes to contract and relax in a synchronous and pulsatile fashion, leading to efficient pumping of blood. The impact of electrical stimulation on mature cardiomyocytes has been explored. For example, neonatal rat cardiomyocytes cultured on polystyrene culture plates were exposed to 80 V of stimulation for 15 min to 72 h . Maximum mRNA levels of β-MHC and COXVa were expressed at 24 h of electrical stimulation exposure. Additionally, hypertrophy and increased mitochondrial content and activity were both produced after 24 h of exposure. Neonatal rat cardiac myocytes were cultured on collagen sponges and exposed to electrical pulses (rectangular, 2 ms, 5 V/cm, 1 Hz) for 5 days. The cells had increased levels of α-MHC, β-MHC, CK-MM, Cx43, and TnI, as well as enhanced contractility and mitochondrial content . Combining topography and electrical stimulation, neonatal rat cardiac myocytes cultured on microgrooved polystyrene displayed signs of maturation and cells became elongated with gap junctions located at the cell-cell contact area . Electrical stimulation was used on 3D biowires made of hPSCs, supporting cells, and collagen sutures . The stimulated constructs expressed cardiac contractile proteins, increased conduction velocity, and enhanced Ca2+ handling properties. The study on cardiac microtissues, as mentioned before, exposed the tissues to electrical stimulation for 4 days . The CMTs exposed to electrical stimulation reached cellular alignment ~2 days earlier than unexposed constructs, in addition to increased dynamic contraction stress. These reports indicate electrical stimulation is a viable tool for cardiomyocyte maturation. Human pluripotent stem cell-derived cardiomyocytes (hPS-CM) at early stage and late stage display marked differences from each other and adult human CM . Reproduced with permission from John Wiley and Sons. The discovery and development of both human embryonic stem cells (hESCs) and induced pluripotent stem cells (iPSCs) have spurred advancements in regenerative medicine and drug development [140, 141]. The development of stem cell-derived cardiomyocytes for these purposes presents particularly interesting applications . Cardiovascular disease (CVD) affects more than 1 in 3 American adults, with over 7 million suffering from myocardial infarctions . Due to the extremely limited regenerative potential of adult heart  and limited number of resident progenitor cells , post infarction myocardium develops scar tissue and severely impairs cardiac function. Consequently, numerous clinical trials have explored the use of stem cell therapy for CVD . During drug development, cardiotoxicity presents a major problem . Drug-induced cardiotoxicity represents the most common cause of post-approval withdrawal, accounting for 45% of all drugs recalled from the market . While the use of stem cell-derived cardiomyocytes has shown promise in these applications, improved models remain necessary . Specifically, stem cell-derived cardiomyocytes fail to recapitulate the physiological function of adult human cardiomyocytes (Figure 6) . This critical drawback not only limits the applicability of currently available models, but also highlights the need for matured stem cell-derived cardiomyocytes. Despite recent efforts, there is currently no well accepted threshold for defining a fully mature stem cell-derived cardiomyocyte [57, 149]. Additionally, maturation methods remain unreliable, even on a small-scale, presenting problems for both in vitro and in vivo applications. The pharmaceutical industry relies heavily on large-scale, high-content screens for drug discovery. Stem cell-derived cardiomyocytes that closely mimic the electrical, chemical, and physical characteristics of adult cardiomyocytes can provide a more human relevant model. However, this process requires a large volume of uniform cells. The same problem exists for the use of matured stem cell-derived cardiomyocytes in cell therapies with the added complication of patient compatibility. Retention, survival, and long-term engraftment of stem cells have been shown to be major hindrances to successful cell therapy for heart failure . Several severe risk factors such as potential for tumor formation  and arrhythmia generation pose additional challenges to stem cell therapy . Matured stem cell-derived cardiomyocytes may alleviate these issues by reducing the differences between native and transplanted cardiomyocytes. Personalization of medicine represents a unique and promising application that combines the use of in vitro and in vivo techniques. Patient sourced iPSC-derived cardiac myocytes have been used for modeling rare electrophysiological disorders  and screening therapies on a patient by patient basis . A model of Barth syndrome, a rare genetic disease that results in cardiomyopathy, has been generated from iPSCs derived from patients and used to explore potential therapies . The use of a patient's own cells to develop personalized disease models minimizes the need for large-scale production and addresses the issue of cell sourcing. The ability to develop healthy, mature cardiomyocytes from a patient's cells would be a major advancement for cell therapies and regenerative medicine. Nonetheless, this approach to studying and treating disease is a radical change from the current paradigm and would require a massive investment in drug discovery and development infrastructure. Ultimately, the short-term application of matured stem cell-derived cardiomyocytes will be to serve as an improvement to existing models used for studying and modeling diseases of the heart. As the efficiency of the maturation process is improved, matured stem cell-derived cardiomyocytes will be a valuable resource to identify and mitigate drug-induced cardiotoxicity. Pluripotent stem cell derived cardiomyocytes (PSC-CM) allow the notion of a constant source of cardiac cells to be feasible. PSC-CM availability will permit the development of improved drug testing platforms and disease modelling, as well as the possibility of cell therapies and tissue transplantation. The purity and yield of PSC-CM has dramatically increased since they were first reported; however, the lack of morphological and functional maturity of the cardiomyocytes has severely limited their use in both regenerative medicine and drug development. A wide variety of bioengineering methods have been explored for the further maturation and development of PSC-CM. These methods include long term culture, co-culture, exposure to mechanical stimuli, 3D culture, cell-matrix interactions, and electrical stimulation. While some improvements were achieved, the gap between the current obtainable maturation state and the required final phenotype is persistently significant. Additionally, the measures by which maturation is quantified are highly variable, indicating a need for a standard metric to determine cardiomyocyte maturity. Further work is required to increase functional maturation and develop improved tools to quantify functional parameters. Select researchers have explored the implantation of immature cardiomyocytes into in vivo animal models [152, 156, 157]. A recent study reported the implantation of neonatal rat ventricular myocytes and hiPSC-CMs into both a neonatal and adult rat heart to determine the effect on maturation . The study presented promising results on the engraftment and morphological maturation of the immature cardiomyocytes, however further functional data on in vivo implantation should be collected to completely assess this technique. Future maturation techniques will likely combine multiple methods listed in this review in order to build towards a biomimetic microenvironment. Additionally, certain dynamic microenvironmental cues, such as substrate elastic moduli, can be further improved to recapitulate the cardiogenic phenomena . In parallel with the improvement and combination of microenvironmental cues to mature cardiac myocytes, the expected values for functional measurements of mature cells must be developed. CVD: cardiovascular disease; PSC-CMs: pluripotent stem cell-derived cardiomyocytes; hPSC-CM: human pluripotent stem cell-derived cardiomyocytes; PSCs: pluripotent stem cells; iPSCs: induced pluripotent stem cells; hESC: human embryonic stem cells; hiPSC-CM: human induced pluripotent stem cell-derived cardiomyocytes; hESC-CM: human embryonic stem cell-derived cardiomyocytes; mESCs: mouse embryonic stem cells; EB: embryoid body; TGF-ß: transforming growth factor beta; Cx43: connexin 43; ß-MHC: beta-myosin heavy chain; SR: sarcoplasmic reticulum; RMP: resting membrane potential; T3: tri-iodo-L-thyronine; BPEL: BSA polyvinylalcohol essential lipids medium; ANP: atrial natriuretic peptide; MTF: muscular thin films; ISO: isotropic; ANISO: anisotropic: LINES: array of discrete muscle fibers; PDMS: polydimethylsiloxane; ROCK: RhoA/RhoA-kinase pathway; HA: hyaluronic acid; ECM: extracellular matrix; PEG: poly-(ethylene glycol); PCL: poly-ε-caprolacton; SERCA2a: sarcoplasmic/endoplasmic reticular calcium ATPase2a. Funded in part by a research award from the Collaborative Research Exchange Forum in Nanotechnology from University of Miami and Florida International University.